Lieutenant Lisa Campbell is the Watch I Commander. 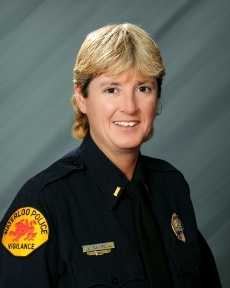 She has been with the Waterloo Police Department Since 1994. She is responsible for the day-to-day operations of Watch I Patrol, covering the hours of 7AM - 3PM. She has also served the department as the Internal Affairs/Personnel Lieutenant, Field Training Officer/Coordinator/Supervisor, the Training Unit Coordinator, and was promoted to the position of Sergeant in 2005. Lieutenant Campbell is a Certified Firearms Instructor, Glock Pistol Armorer, Remington Armorer and is the Liaison for the Ballistic Vest Committee. She has a Bachelor of Science degree in Public Administration from Upper Iowa University and attended the Iowa Law Enforcement Academy in 1988 when she began her career in Law Enforcement.